I wanted to shed some light on how my camera app, Obscura, has been doing recently. I don’t write regularly but I’ve wanted to share my thought process in the hopes that it might help others facing similar challenges. I want to write the kind of articles I wish I could’ve read a year or two ago. So I’ll start at the start. One of the strange things about software development is that it exists on a spectrum of hobby and business. It’s hard to define success when no two people share the same goals. You need to work out if the goal is to be financially successful, wildly rich, well respected, a member of a community. Underscore David Smith gave a great talk about this at Release Notes. To him success was enough money to provide for his family and then to spend the rest of his time with them. When Obscura was still in development it resulted in a job offer that seemed to pay more money than I ever expected to make by selling a camera app myself. And that had an important effect, it meant that the primary goal of launching the app was not financial success. And in many ways that was very liberating. It’s easier to get away with bugs and crashes when your users haven’t spent money. It lowers the expectations and gives room for more trial and error. Which is important because I’m still very new to all this. I only started iOS development in May 2014. I’d been doing it for less than 3 months when I started work on Obscura and most of that was done in my spare time around college. Unfortunately the job offer fell through because of visa complications right at the time that I was launching Obscura. This was especially problematic as I was in San Francisco with no job and nowhere permanent to stay. So very quickly the circumstances around Obscura changed. And with that so did the priorities, naturally. Unsurprisingly I was now much more interesting in making some money with Obscura. Over Obscura’s launch it made $350. And to honest I didn’t really know what to expect. Really the positive feedback from the community meant more than the money. I knew of course that it could make more money, but at the very least it was out in the world. I use it regularly and it was nice to see others creating great images with my app. I couldn’t help but take pride in the work of others. Over the next 6 months Obscura made me another $450 and reached a total of 30,000 downloads. For the majority of its life it saw between 6o and 100 downloads per day, but only a couple of conversions to paid customers. On a good day. By the end of the summer it was pretty evident that even with the lowest expectations, changing to paid upfront would bring in more money. All the major bugs had been squashed and I was feeling more confident that Obscura could justify a respectable price tag. For the longest time I was stuck with two issues. As soon as they were resolved then the app would be ready to change. One was redoing the sharing from the photo browser and the second was an issue with GPS metadata. Eventually both were resolved, sent out to beta testers and submitted to app review by the middle of December. It passed app review and was approved for release as I pushed the button on the morning of December 17th. Excellent. Oh there was just one hiccup. Spoilers. December 17 was right in the middle of the launch of Star Wars. Even if I wasn’t distracted enough myself, half the people I know we’re avoiding Twitter or the Internet as a whole for fear of spoilers. exactly the wrong sort of environment to try and market an update in. And the weekend isn’t much good either. Attention is scattered and any press people who might be interested were probably not in the mood for writing on their days off. So Monday, right? And that would make sure I was out in plenty of time for Christmas. And just before app review closed on Tuesday the 22nd. Perfect. Okay so let’s just acknowledge for a second that releasing a major update without the ability to submit any bug fixes for at least a week, let alone have them approved and released is astonishingly stupid. If you take nothing else away from this whole article, at least remember that. Here’s where everything changed. On Saturday morning I saw an unusual amount of emails reporting crashes in Obscura. Definitely odd, maybe a little concerning but whatever. Then I got an email (again from the analytics and crash reporting service I use, Crashltyics) reporting a huge spike in activations. So I knew something was happening, but Saturday ended up being a busy day (second viewing of The Force Awakens, naturally). Sunday morning saw a similar email. But there was no obvious source. Well if there was no external source pointing people towards Obscura, then it must be coming from within the App Store. Okay crazy thought, but what if it had been featured. A quick trip to the front of the App Store and with a little digging, yes. It was there. Tucked away behind a “See All >” button, but featured. I was gobsmacked. I was asked by a fellow developer if there was anyone on the App Store editorial team I could put him in touch with, to which I could only laugh. The whole thing was completely unexpected. Okay Sunday morning. My app is being featured. I have an update ready to go, I plan on releasing it tomorrow. There have been maybe 15,000 downloads already. I can only imagine how many people had seen. Of course many questions immediately arise: Is it just on the Irish store? I checked the U.S. App Store, but no sign. 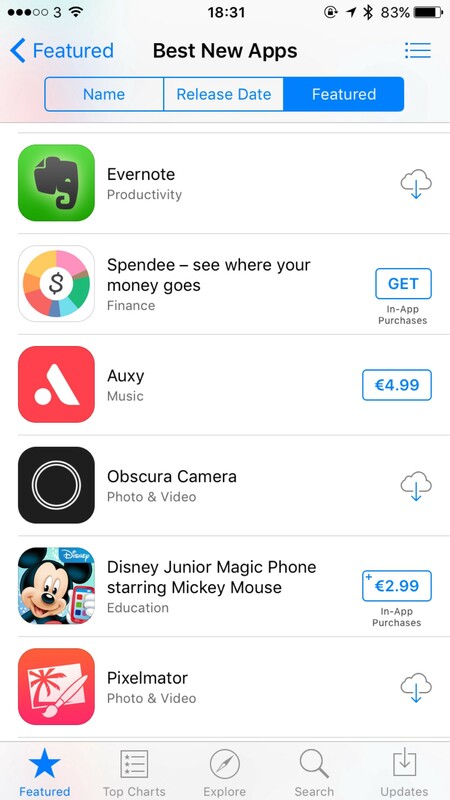 I know the Irish App Store gets updated with new content between Thursday and Friday, perhaps America has a separate schedule. Of course I’m wondering how many people were likely to download it in total. A few tens of thousands if it maintained anything like this rate for a week. Most of them probably just curious about anything free and featured, but certainly some of them would be willing to pay, and it would be a shame to lose so many sales by waiting a day to release.. So I quickly set about releasing the new version and changing the price. By lunchtime it was done. I’d hold off on the marketing push until Monday like I’d already planned. Of course on Monday that involved waiting until the evening, for the west coast to wake up. I wrote up a blog post on why the change was happening. Sent it to a few friends and then just waited really. By this point I was only looking at activation numbers. Which given the lack of distinction between free and paid activations didn’t tell me much about what sort of money was coming in but it all looked positive. 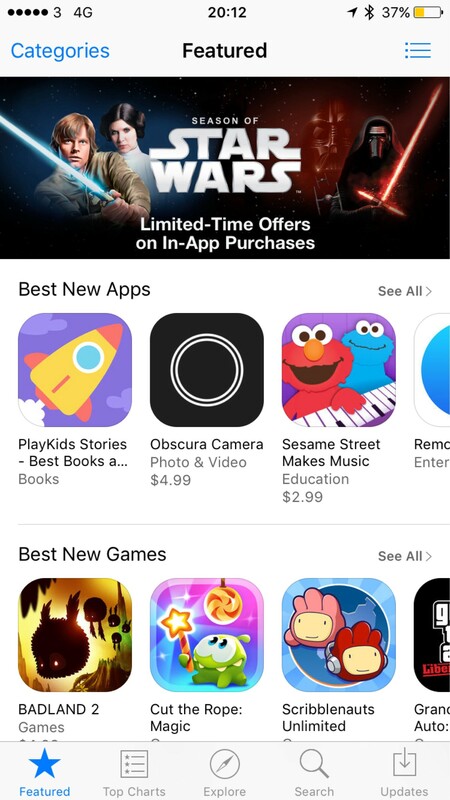 On Monday evening it was pointed out that Obscura was now being featured on the front of the U.S. Store and not long after, fantastic mentions on Daring Fireball, The Loop and iMore. By this stage I was physically shaking. As can happen when dreams become reality. By this stage you’re probably wondering, just what sort of effect does being featured on the front of the App Store cause? It’s had 370,000 views over December. There was around 22,500 free downloads and about 3,500 paying customers. Which means around a 6% and 1% conversion respectively. I imagine there was never any hope of converting most of these people as an App Store feature probably results in far more window shopping than views that come on searches. But on to the good stuff. Income over Obscura’s lifespan. Notice the launch at the end of June. I think the graph speaks for itself. 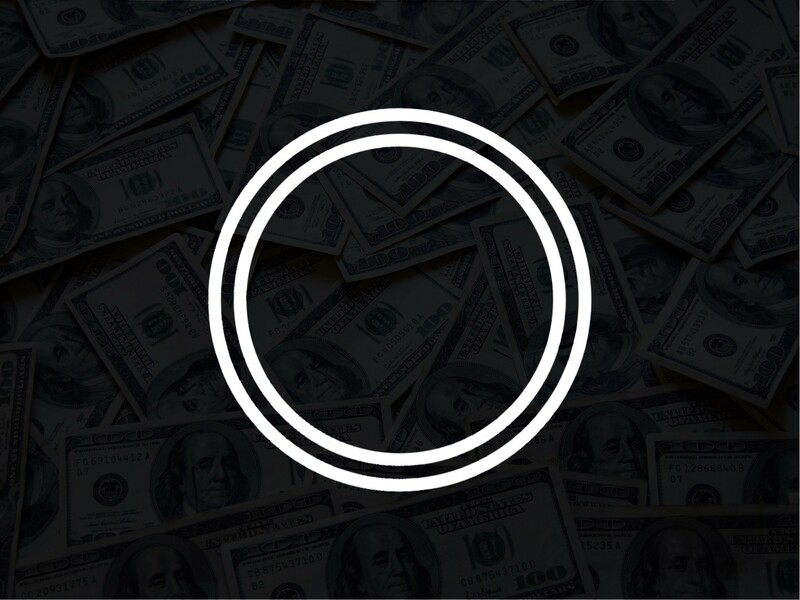 Over the last week Obscura has made a significant amount of money that will allow me to continue to invest time in it. It’ll help get me through my last term of college. It’ll give me some freedom to work on future products and projects. It’s more than I ever expected from my little camera app. In cold, hard numbers it looks like it’ll bring in about $13k over December. It earned $19.62 in November. I don’t particularly enjoy discussing income but I feel like it’s important as an independent developer to be share. I want to encourage new developers that success is always within reach. I want to make it clear that you don’t really have to know what you’re doing as long as you keep trying and work passionately. Sunday the 20th is when I changed the pricing model. One issue with this sudden influx of users, combined with a rather rushed update is that a bug slipped through. Of course bugs always slip through but this one was particular insidious. In fixing a previous issue with GPS I had created another: if the app doesn’t have permission to use location services, it’ll crash when trying to take a photo. Which is pretty crappy for everyone. Thankfully it’s a quick and easy fix for the user, but only if they contact me and hear about the solution. Of course, I realized this very quickly on Sunday afternoon and had a fix submitted to Apple first thing Monday morning. Unfortunately it didn’t go through review before the app review system closed for Christmas. And as a result I’ve been dealing with angry emails (nice ones too) and negative reviews all week. Just goes to show the importance of testing. Another issue that was raised on this weeks episode of the Release Notes podcast (hosted by Charles Perry and Joe Cieplinski, who’s conference was a great reassurance that a new pricing model was a good move) was that I might aggravate the App Store editorial team for changing the price while being featured. I must admit the thought never occurred to me. I certainly hope that wasn’t the case, but I have to imagine they want to see developers succeed too. There’s some important takeaways here (I hope). The first is that the only way to be successful is tremendous amounts of luck and generosity from a faceless organisation and everything else is futile. Well no. What’s important is to build something you love, something you’re proud of. You might not be able to give it a lot of time but give it the attention it deserves. It might also seem like a sudden success story. But in reality I’ve been working on Obscura for a year and a half. I’ve been involved in Apple-related conferences for three years. I’ve been taking pictures for 5. None of this would have happened without some people, smarter and more talented than me, who’ve been generous with their time and attention. It wouldn’t have happened without a photographer for a father or three years of design school. Overnight successes take a great deal of time. And I don’t expect it’ll be easy to maintain. Maybe the most important takeaway is don’t listen to me. Go build something instead. Define your own goals and let that be the measure of your success. If you want to download Obscura you can find it here, or say hi on twitter. Designer, photographer, occasional source of wit. Will create things for money.